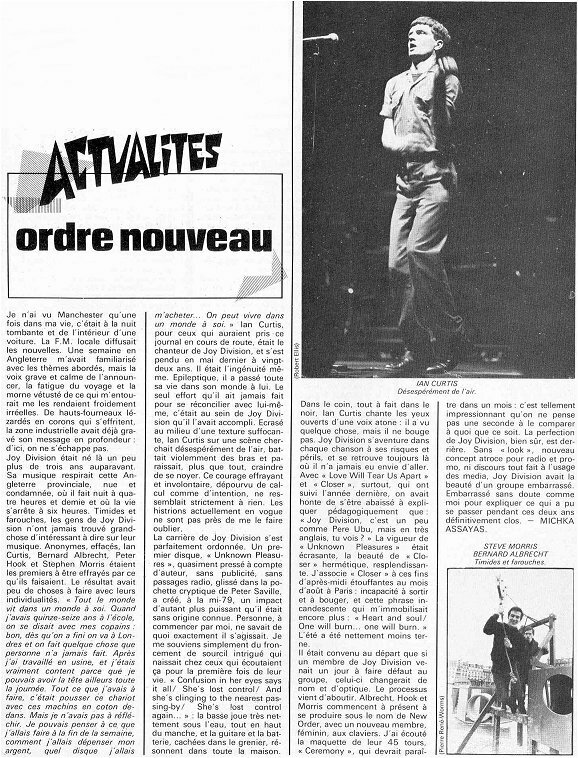 This is an attempt to translate Michka Assayas's review written in 1981 for New Order debuts. I only saw Manchester once, at dusk, from a car. It was news time on the local radio. After a week spent in England, I was getting used to the questions tackled, but the low and calm voice of the speaker, added to the trip's weariness and to the surroundings bleak decay made them sound unreal. Factory chimneys, crumbling buildings, the message was clear: you can't escape from here. Joy Division were born there three years ago. Their music came from that provincial part of England, naked, condemned, where night falls at 4:30 pm and life stops by 6. Shy and fierce, Joy Division never liked to talk about their music. Anonymous, retiring, Ian Curtis, Bernard Albrecht, Peter Hook and Stephen Morris were the first ones to be frightened by what they did. The result had nothing to do with their individualities. "Everybody lives in his own world. When I was 15 or 16 at school, I was thinking with the lads: well, as soon as school's over, we go to London, and do something nobody else ever did. Then I worked in a factory, and I was really happy because I could think about something else all day long. All I had to do was push this waggon with cotton stuff in it. I didn't have to think about it. I could think about what I was going to do by the end of the week, how I was going to spend my money, which record I would buy ... You can live in your own world." Ian Curtis, for those who wouldn't know, was Joy Division singer, and hanged himself last may at the age of 22. He was simplicity made man. Epileptic, he spent his life in his own world. The only attempt he ever made to make it up with himself was within Joy Division. Crushed in a suffocating atmosphere, Ian Curtis on stage searched desperately for air, his arms flying in all directions looking as if he was drowning, or as if he feared that more than any other thing. This dreadful and unintentional courage, without any selfish motive as well as any purpose, was unknown. Fashionable histrions in vogue today will never ever make me forget this. Joy Division career unfolded perfectly. A first record, "Unknown Pleasures", almost privately released, without publicity, without radio support, with its mysterious cover by Peter Saville, had a powerful impact in the middle of 79, as nobody knew anything about it. Nobody and me first of all had any idea about what it was. I can only recall the puzzled frowning of every new listener. "Confusion in her eyes says it all / She's lost control / And she's clinging to the nearest passing-by / She's lost control again ...": the bass plays really underwater, up the neck, and the guitar and the drums, hidden in the attic reverberate in the whole house. In a corner, in the dark, Ian Curtis sings with his eyes wide open in an atonic voice: he has seen something, but does not move. Joy Division venture in each song, at their own risk, and always find themselves where they didn't want to be. With "Love Will Tear Us Apart" and "Closer" that followed last year, we were ashamed of having had to stoop to explaining that "Joy Division were a little like Pere Ubu, in an english way, you see ?". "Unknown Pleasures" vigour was overwhelming, "Closer" beauty, hermetic, dazzling. "Closer" makes me think of these suffocating parisian August afternoons: incapacity to get out or move, and these white heated words: "Heart and soul / One will burn ... One will burn". Last summer was definitely less dull. Joy Division members had agreed that if one of them left the band, they would change their name and music. The process is just over. Albrecht, Hook and Morris now play as New Order, with a new feminine member on keyboards. I listened to their new single "Ceremony" which should be released next month: it is so impressive that you can't compare it with anything else. Joy Division perfection is there of course. Without any image, new heinous concept for radios and promotion, and any ready-made speech for the press, Joy Division had the beauty of an embarrassed band. Doubtlessly embarrassed as I am to explain whatever happened during these two years forever concluded.